Gemstone setting is a precise and intensive practice that involves training the eyes as well as the hands. This two day workshop will give students a strong foundation in basic stone setting skills to help build precision and proficiency in their work. 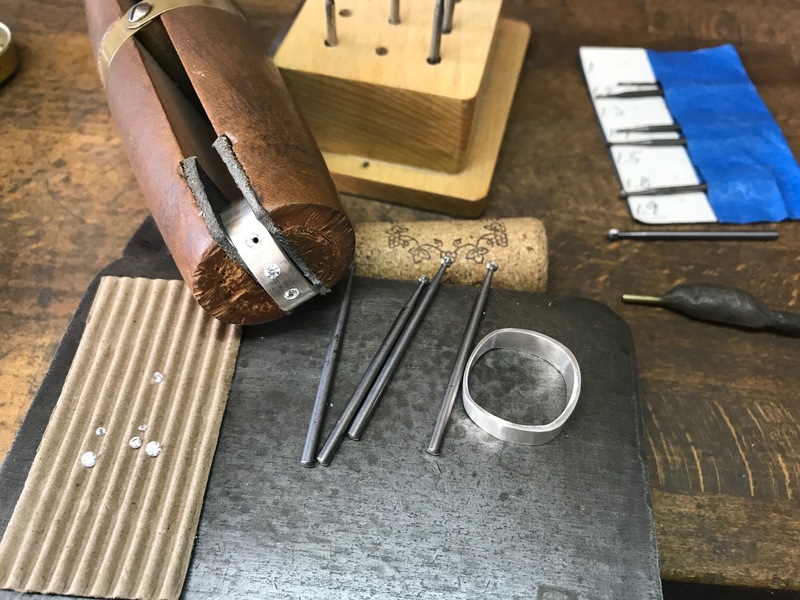 Students will be taught how to set round faceted stones directly into metal using the flush setting (also known as burnish setting) technique. Several approaches to this style of setting will be taught, utilizing different types of burs. Specific techniques taught will include tool making, precise marking with scribes and dividers, design layout, drilling, proper use of burs, and burnishing to secure settings. Finishing, polishing, care and wear on settings will also be covered. At this workshop students will become more comfortable working under magnification using visors and loupes. Through in class discussions students will learn about different gemstone cuts and variations in colored gemstones. How to determine which designs work well with this setting style, limitations on this approach, and questions to ask setters when outsourcing will also be covered. This course is designed to build confidence in understanding the fundamentals of stone setting. By learning which tools to use, why they are useful, and when variations may be necessary, students will gain a deeper knowledge of the processes. This diversified approach to stone setting gives students more flexibility at the bench, allows for quicker problem solving, and improved workflow. This class is open to all levels. Those with previous stone setting experience may follow the techniques more quickly, but anyone with the interest and patience to learn is welcome. The supply list for this workshop is comprehensive and will give students the tools necessary for multiple setting styles. The setting practice kit is sold separately and will be available for purchase at the beginning of the workshop.